Is my closet trying to tell me something? Umm... too many running clothes perhaps? Nah! I was just putting away my clothes from the laundry and I received a bit of a shock. No, it wasn't the fact I was actually putting away the laundry, although the dust-bunnies in the laundry basket were a little stunned by the sudden day-light. The stagger backwards in a daze, wasn't the fact that this is the total amount of clothes I own. That top rack is pretty much it -- I do have some summer kit hiding under the bed, but for the next four-to-five months this is my total wardrobe. 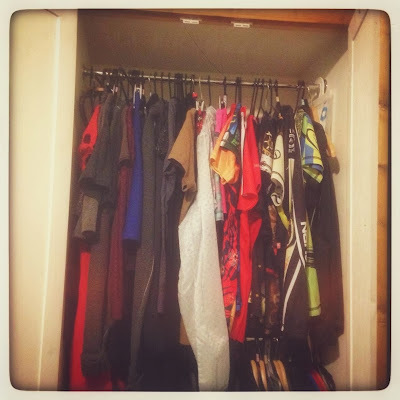 Before I get yells of horror from those whose wardrobe is twenty-foot long -with three rails and an additional shoe rack- I am happy with the amount of clothes I own. I am not really that fussed on getting the latest handbag or sweater. I also don't own that many shoes; okay, I own lots of pairs of running shoes, but if you discount that, then really my shoe collection is single figures. My running shoe collection pretty much mirrors what is happening in my closet. See, Running kit at the Royal Albert Hall. You see that white vinyl jacket in the middle? Everything to the right of that are my running clothes; everything to the left are my normal every-day, going to the dentist, going to the bank and going out party clothes. Yep, about half of my clothes are due to my 'hobby'. Actually to be brutally fair, the running kit are also the clothes I would use to go to the dentist, the bank and going out too. You think I joke? 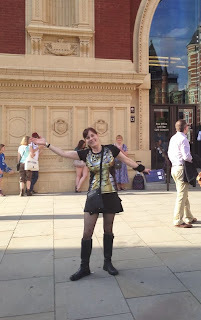 I actually went to the Royal Albert Hall last June, in my InkNBurn Steampunk t-shirt and running skirt. I sat in front of Matt Smith (Swoon) and the Welsh Philharmonic Orchestra, as well a few Cybermen, Daleks and ohh, yes an Ice Warrior. 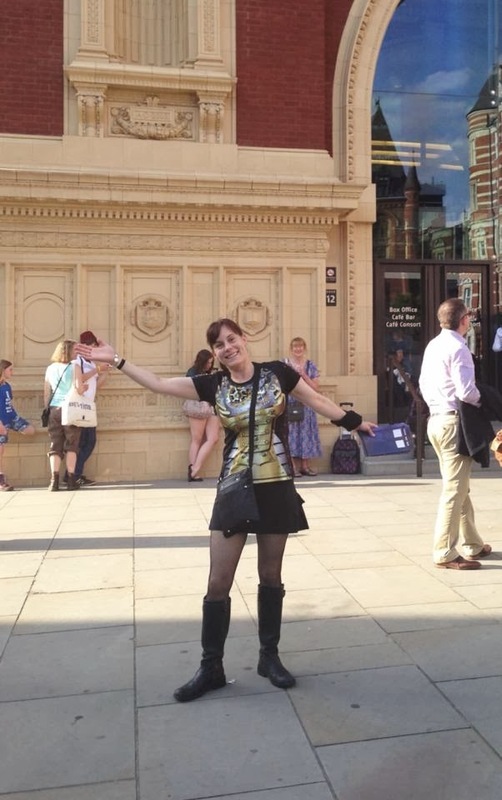 They are also probably the most expensive clothes I own: The main reason I went to the Royal Albert Hall in them. However, for some reason -old age amnesia probably- I keep forgetting I am a runner. Have you also noticed something else between the left-hand and the right-hand side of the wardrobe? Look at the colours. The left is in my usual palette of grey, black, dark and mono-chrome colours. Not a fancy pattern or a colour warranting sunglasses. Have you checked out the right side? Yes, there are blacks in there, but check out the shirts and the skirts. Every colour you can think of -- all requiring eye surgery after viewing. See those patterns and the designs. The number of plain -and frankly boring- monochrome running shirts equals one; and that is used as a base-layer in the winter. I never go running out in it just on it's own! What sort of person do you think I am? Well, this is it. My closet is not only reminding that I am a runner, but the fact I am a loud, in-your-face, 'woo-hoo I am having fun', runner. I am not saying that I only have an over-the-top personality whilst I am running, (if you have met me you know that isn't true -- I am a shock to most people, most of the time), but the fact that I love to show it more as I run. I am not the fastest runner in the world -in fact this year, my back has ensured that I am more turtle than hare- but I like to think I am the 'Party Runner'. I go out there to have fun, to make people smile and to bring a bit of sunshine. If I race, it's not for a PB, but for the fact I get to see somewhere different, probably with someone new and usually with a giggle on the way. My runs lately about having a good time and showing the world that they are welcome to join me. I like that. I like the fact that my closet reflects what I want in the coming year. Sure, I would love to be quicker and perhaps run further, but I am more aware, that my ultimate goal is to go out and bring a little bit of sunshine on my runs. It may be dark, wintery and cold (with a lot of wet), but around me you will need sunglasses and one of those little cocktails with an umbrella in it. That'll be my new years' resolution; my fitness goal for 2014. I am going to run bright, run fun and run cool. All I need now is the Hawaiian Lei, the grass skirt, the sunglasses and the flip-flops. Wait, I have those already -- I knew there was a reason I spent all that money on those running huraches. (Just to give you advance warning, I have another couple of posts up my sleeve. I am just finding it a little tricky being able to show that in fact I am the Doctor and my life mirrors his regenerations quite closely. Hey, it's Christmas and when you have a bottle of Sloe Gin by your side anything seems possible). … Up that is. Busted. Knackered. Broken. Injured. "a road accident left him severely injured"
My running friend, Nikki, is injured. She is also very frustrated, annoyed and it can be safely said a little depressed about the whole situation. She is almost rabid with the runners’ curse; that ‘ant’s in your pants’, fidgety feeling you get when you mind wants to run and your body isn’t letting you. This is the first time she has been injured to the point where she has to back off on the running. This is a huge learning curve for her. I am all too familiar with the injury frustration. I am an ‘old-hand’ at the grit-and-bare-it depression you get when you are having to contain all that nervous energy into sitting still. I completely understand that ‘Jumping-bean’ feeling you get in your stomach and the complementary snarkiness you dish out to friends and family. Oh, I have SO been there. Injury is always a mentally taxing time for anyone; and even more so for someone who is quite physically active. When it happens it can feel like the world has ended, but what it doesn’t feel like is, is a learning experience. However, injury is the greatest tool in a runners’ mental arsenal. When you are running –or in fact doing anything physically strenuous- there are times when you feel you can’t go on. Times when you wish you could stop, but for some reason you have to go on. You can physically train for anything, but there is no way to practice for the mental challenges. Well, actually there is. Break yourself physically. (un-intentionally of course. I am not suggesting that as part of your training plan for your marathon you should go out and break a leg or anything). Injury is the greatest tool we have for our physical challenges. There is a lot to be learnt, but only if you are willing to listen. Here is a list of what injury teaches us. 1 1) You are adaptable. My friend Nikki was completely desolate that all of her training plans have been pushed out of the way due to her tendonitis. She felt that her racing aims next year are now in the gutter and that there was no way out of this. Injury allows us to stop and reflect on our training plans. Preparing for a race is not all about running; there are other ways to get to the same objective. Bring in pool-running, weights, cycling, in-fact-anything that gets the job done. I am a huge fan of pool running – although it has been over a year since I last did any. When I broke my ankle, then knee a couple of year’s later, pool-running was my savior – mentally and physically. There is nothing like the feeling you get when you dress as a partially dressed drowning rodent that is giving birth to make you feel good about yourself. 2) There is more to life than just running (or what-ever physical exercise you are into). We quite often lose perspective when we immerse ourselves in our hobby. As we become better, we become more obsessed about getting to the next level. We train more; train harder. However, this generally comes at the expense of other passions in our life. Injury allows us to put other hobbies and passions in the lime-light. Forgotten that you could belly-dance and you were damn good at it? Now is the time to remember! 3) When you’re injured your social life doesn’t stop. Hands-up all those who have tried to avoid anyone doing any type of physical exercise as you lie-back in pain-killer induced fog? Yep, me too. However, when you are experiencing the low of actually not getting out there and doing what-ever, then you are also adding to that by avoiding the support network of your friends. Nikki, took to volunteering at the weekly Conkers Parkrun when she was injured and it meant she had the mental boost of doing something supportive to others, as well as having a good time hanging out with her friends. Face-it, the nutters that hang around with you when you are running (or what-ever) are the only nutters that will cope with you when you are in your manic lunatic injured phase. 4) Next time, injury won’t be so scary. The first time you are injured, it is scary. Especially after a long injury, you never feel you will ever get back there again. The future seems like a far-distant-land that you will never reach. However, being injured will morph into recovery, and then finally, into being one-hundred-percent fit. Next time you are injured, you will remember the fact that you will recover and that it is just a matter of time. You have learnt what you can do to pass the time both mentally and physically. Next time you are injured, the family won’t be calling out the Doctor for family therapy. Well, okay… maybe a little – just remember to channel your aggravation into baking and they won’t care that they have to walk slowly instead of running up the stairs. 5) This too will pass. During our long runs or races we all hit a period where we think we can’t go on. That all we want to do is to stop and have everything to finish. However, in that pit of ‘The Wall’ we all know we have to go on. Having faced injury, you know pain. The pain you feel as you hit ‘The Wall’ is probably not as intense or as prolonged as being injured. You have a new perspective on what your body can actually go through. Anything you physically feel as you run is just temporary. Yes, it hurts. Yes you want to stop. Yet, there were times you were forced to stop and then –and after- it really DID hurt. Trust me after running up a mountain for three-miles on a broken knee, I now know that a little stitch and wanting to puke is small-fry. 6) You will come back from this stronger. Let’s face it, those hours (and dollars) spent at the Physiotherapist are going to be doing something. Most people are injured because the way they have excercised has been lousy. Their form (wether that be running, swimming, lifting, whater-ever) was probably shocking and as such the body has caved. The physio will high-light where you went wrong; what you need to do to get it right. All those that have actually spent weeks doing physio-therapy will know that the excercises actually hurt. They aren’t fun. They aren’t fun for a reason and as such you are getting stronger. When you come back, you will be stronger, wiser and body-smarter. Remember this. So, here is my condensed list on why being injured is good for you. Why, everyone at some point should embrace being injured and you shouldn’t treat a period of inactivity as a major-disaster. If the mental mantra’s above don’t help you, then may I suggest chocolate and alcohol. Next to therapy, they are the best way to avoid expensive divorces and the lament of lost friendships. I am talking about giving chocolate and alcohol, not eating it. DO YOU HEAR THAT NIKKI? CHOCOLATE AND ALCOHOL. Do you think that was subtle enough? You know you get those races where the only object of the run is to be as silly as possible? No? 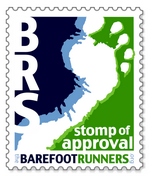 Wow, there are some boring runners out there. If you said ‘Yes’, then welcome to my club – yes, you can be afraid of the honour if it helps. 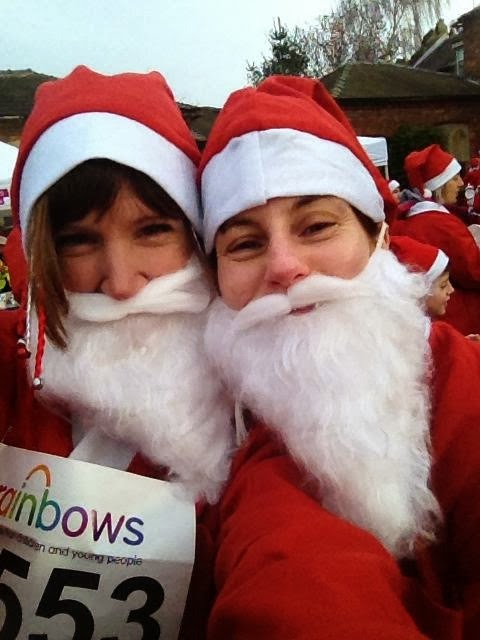 Last Sunday, my friend Nikki and I ran a race -a 4.4 mile Santa Run- and to be brutally honest, we weren’t at our best. We wish we were suffering from a humongous (I like the word ‘humongous’, I may use it more in conversation) hangover, but frankly we were both a little broken. Nikki has been on the road to recovery from tendonitis, and I was on the tail-end of a lingering chest cold. It was a case of the lame leading the infectious. The beauty of Santa races is the fact that you can be as stupid and as slow as you like, and unless someone clocks your bib-number, you are completely incognito. Why? Everyone is wearing the same Santa suit. You are just one of seven-hundred Santa’s all running the same route. This had a possible side-effect that Nikki and I had realised early-on. From the start of the race we made it our mission to be as rude as possible. For us it isn’t as hard as it may seem. We had spent the pre-ceding Friday having loud conversations about ‘Tart Plungers’ and big balls that were a mouthful at our Christmas Girls Night out. "Come here little girl and stroke my beard"
Firstly, we rejoiced in the beauty of arriving at the start thirty minutes early. Why? 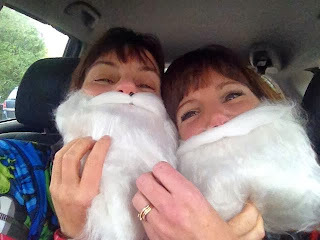 Because we wanted to play with each others’ beards; our false Santa beards! What were you people thinking of?! snicker. With comments of: “Come here little girl and stroke my beard”, to “Come here little girl and look in my pocket [on the coat] and you’ll find a present [of Jelly Babies]”, we then progressed to stroking our bellies in a suggestive way. 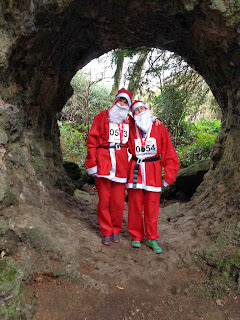 Okay, that bit was just me; however, it was quite apparent before we had even started that we were the creepiest Santa’s on the course. The short walk to the start was uneventful – well as uneventful as walking to a dis-used Castle with five hundred Santa’s (and a couple of elves) could be. At the start, we eyed up the most senior and most important person we could find to take our photo’s and then dared each other to ask him. It was some type of mayor or something or other. Luckily for us, I managed to keep my comments to myself and he didn’t realize he was one step away from taking a mug-shot of the ‘Arctic’s Most Wanted’ –next to ‘Barry the Elf’ and ‘Jeff the Reindeer’ who were ‘lewd, and crude and rude’. The start was more a mass ‘escape of Elf-catraz’ (get it?) with a plethora of false bearded, felt suited and very over-heated Santa’s all running as fast as their little legs could carry them. Nikki and I took this opportunity to engage with our fellow Claus-ian friends. Actually, it was more of a case of Nikki and I shouting very loudly and seeing who would respond. Our biggest catch were two Santa’s who were very interested in my ‘Chest pulling’, (I discovered coughing and running were not a good combination) and why my hat stood up after playing with the ball. As we left the half-way point of the first lap, we encountered our own little mascot. I wish we knew his name, so from this point I will call him ‘Norm’, mainly because I like the name and I think it suited him. 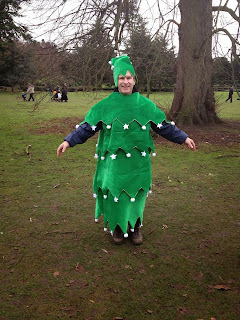 Norm, was dressed as a Christmas Tree and we couldn’t help but sing, “Christmas Tree, O’ Christmas Tree” as we jogged past. I did realize as I went into the third line of the song, I actually don’t know the third line to the song and it was pointed out that “your balls are small and your lights only blink” was probably a little derogatory and insulting. I am sure they were the right lines. Huh. The urge to cough was very apparent and I now became the dodgy Santa who liked to breathe heavily with a certain amount of wheezing. 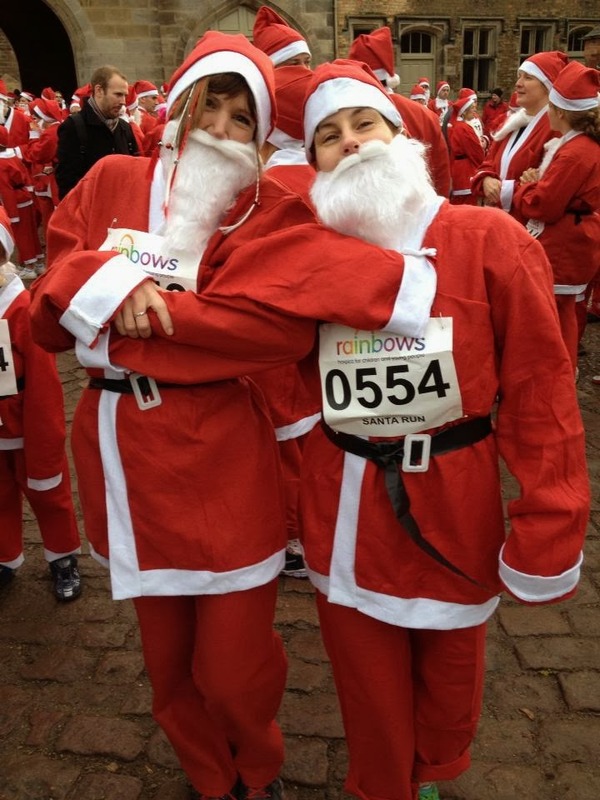 As we turned for the next lap it was only ‘Limping along Santa’ A.K.A Nikki, who kept me going. For an injured person, she run’s bloody quickly. The crowd had thinned out as the majority of the Santa’s participating had realized that 2.2 miles was a good distance to justify chocolate marsh-mellow pancakes and cider. Clever bunch. Nikki was enthusiastic and I made the mistake of following her slip-stream. It was a mistake because she’s smaller than me and was no use what-so-ever in removing some of the wind. 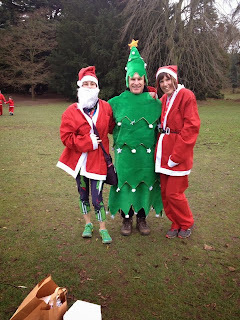 We plodded along -well Nikki plodded and I huffed- until we got to our friendly Christmas Tree called ‘Norm’. I didn’t help on the lookout for him as I wasn’t wearing my glasses, so my only contribution to the conversation was, “That’s him… wait, or is it a tree? No, it’s just some bushes”. Nikki was barely holding herself from crumpling with laughter. 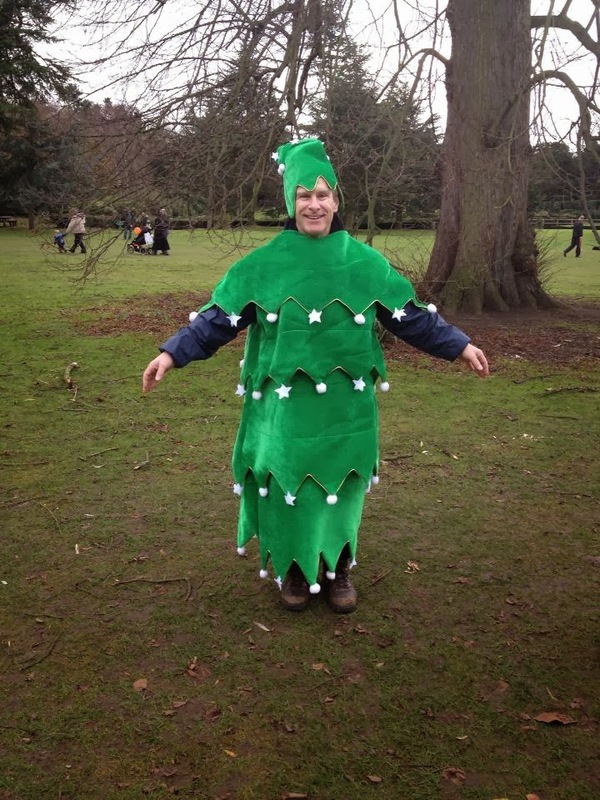 We managed to locate him –he was a six-foot man dressed as a Christmas tree, how hard could he be to find? We sang our ditty again (this time I omitted my made up and personally attacking lines), and it was enough to make him blush. He was just being kind so we –okay more I—would stop singing. There is a good reason I am banned from singing in the car. As we got towards the end, my wish to curl up and collapse was only held off by Nikki tempting me with alcoholic cupcakes at the end. Damn, she knows how to motivate me. 'hobbity' type hole. It's artistic people! Finish done in 38:15 and we immediately headed off after collecting our frankly awesome medals to get some cash from the car; oh and to strip. Before you get any idea’s on Santa-on-Santa action here, may I just point out that sweat-dripping felt Santa suits is not a good look. It wasn't just the Grinch who stole Christmas. In the end we managed to spend £20 on alcoholic cupcakes and coffee. We picked up a few items before we realized that if we carried on, I may be over the legal limit to drive back. We stopped briefly for photo’s; mainly my version of Zombie Santa (I felt it was necessary to wear my InkNBurn Halloween outfit underneath for added fun) and as many silly poses as we could get away with, without mental health professionals being called in to assess us. How we love you Christmas Tree"
We also managed to find Norm, who graciously posed for photo’s with us. A Christmas race isn’t complete without singing stupid Australian Christmas Songs whilst still wearing Santa hats on the drive home. I also ensured that I wore my Zombie Santa outfit (complete with hat and beard) around the local food store, because really provincial England has not been shocked enough with my running get-up. All in all, I am reminded that, being injured and full of cold, creates some of the most fantastic runs. The whole idea that you need to run to be fast sometimes just ruins all the fun. I mean what’s the point of getting a PB, if you are miserable doing it. You will find sometimes that running for a laugh will get you that PB you wanted AND you also have a story to tell at the end. 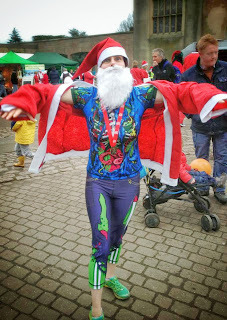 Of course it also helps in obtaining your PB, if you have never run a ‘4.4 mile, dressed as a creepy Santa’ race before. A PB is pretty much guaranteed regardless of how slow –or in fact how rude- you are!